1 in 4 people in the UK will experience a mental health issue this year but by educating youngsters in schools and offering structured physical activity sessions to adults within Warrington, we will begin to tackle the stigma and raise awareness. The Wolves are holding 'Offload' sessions that will pass on the same skills used by elite performers to help you build your own mental fitness and a better mindset. 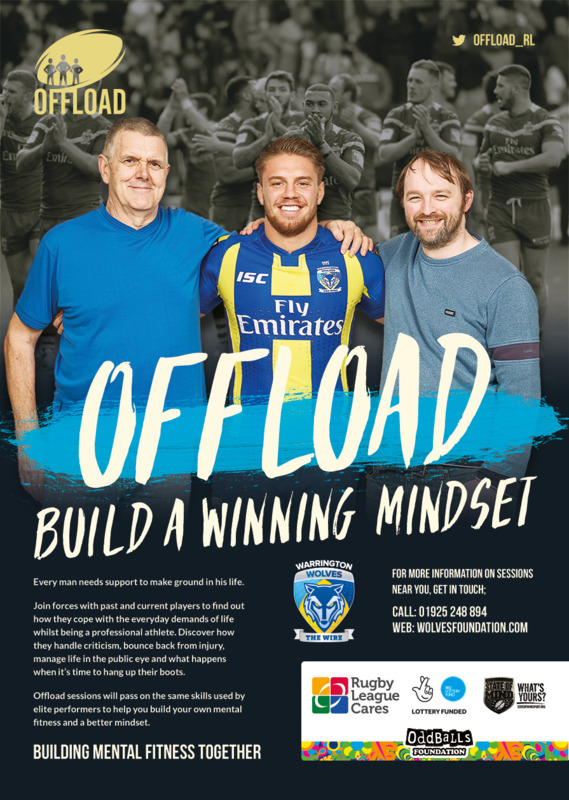 Offload is a new Big Lottery funded initiative, offering a creative, engaging and effective mental fitness project for men in deprived areas. The project is a collaboration between Rugby League Cares and State of Mind Sport. Offload gives men the opportunity to go behind the scenes of the great game of Rugby League and learn the mental fitness techniques used by professional players. Through this we aim to help men develop better coping strategies, have a better understanding of their own wellbeing needs and gain tools designed to help them cope better with life. Rugby League Cares State of Mind. We all deserve to enjoy life and feel good about ourselves. Sometimes however life can be tough. Are you 17 and under? You can meet with a CAMHS worker – you can meet them alone or have another person with you if you prefer and confidentiality will be discussed. The clinician will ask you some questions about your current difficulties. Together you will agree a plan of support and the clinician will explain what happens next. You can meet them at Warrington Youth Cafe on a Tuesday 12.00pm - 1.00pm or on Wednesday 4.300pm - 6.00pm. If you have any questions you can call or have your parent/carer call us to discuss on 01925 579405. Pyramid & Parr Hall - Pyramid is home to many different classes, workshops and sessions. The perfect opportunity to have fun, get fit, meet new friends and learn new skills – whatever your age or experience! Please go to Pyramid Parr Hall for further information about classes and call the Box Office on 01925 442345 before starting a new class. Pricing and times for classes are set to change. Please contact Box Office directly on 01925 442345 for the most up-to-date information. Young Minds provides support and advice to children and young people about a variety of mental health issues. Kooth provides on-line support, counselling, information and peer support. The website is free, safe and anonymous. Get Connected is a free, confidential and multi-issue helpline service for young people under 25 who need help, but don't know where to turn. Teen Mental Health provides resources, advice and information for teenagers who are worried about their mental health. NSHN National self-harm network aims to support individual who self-harm to reduce emotional distress and improve their quality of life. BEAT Beat is a charity supporting anyone effected by eating disorders or difficulties with food, weight and shape. Beat provides advice on what to do and how to get support. Make-time The aim of Make Time is to promote the Five Ways to Wellbeing. These are a set of five activities that have been proven to help boost our mental wellbeing if we practice them regularly. Time To Change Time To Change aims to improve public attitudes and behaviour towards people with mental health problems and reduce the amount of discrimination that people with mental health problems report in their personal relationships, their social lives and at work.